Автор(ы): Albert H. Hofstra, Dahl A.R., Folger H.W., Lewchuk M., Loranger R.J., Naeser C.W., Phinisey J.D., Rye R.O., Snee L.W., Stein H.J. Издание: Economic geology, 1998 г., 34 стр. 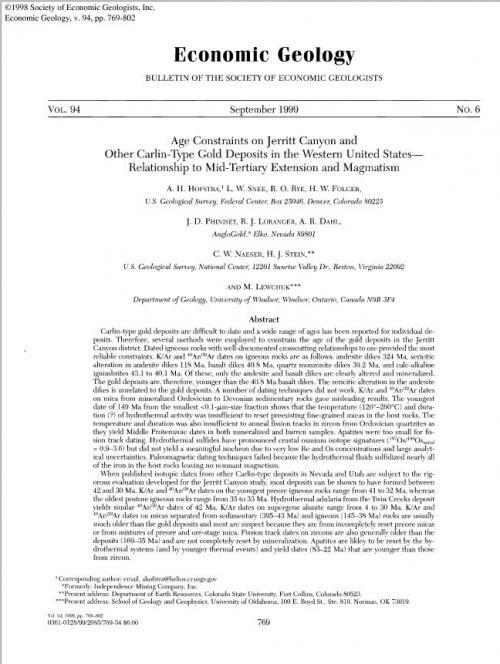 Carlin-type gold deposits are difficult to date and a wide range of ages has been reported for individual deposits. 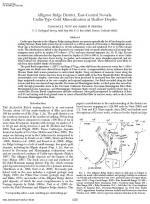 Therefore, several methods were employed to constrain the age of the gold deposits in the Jerritt Canyon district. Dated igneous rocks with well-documented crosscutting relationships to ore provided the most reliable constraints. K/Ar and 40Ar/39Ar dates on igneous rocks are as follows: andesite dikes 324 Ma, sericitic alteration in andesite dikes 118 Ma, basalt dikes 40.8 Ma, quartz monzonite dikes 39.2 Ma, and calc-alkaline ignimbrites 43.1 to 40.1 Ma. Of these, only the andesite and basalt dikes are clearly altered and mineralized. The gold deposits are, therefore, younger than the 40.8 Ma basalt dikes. 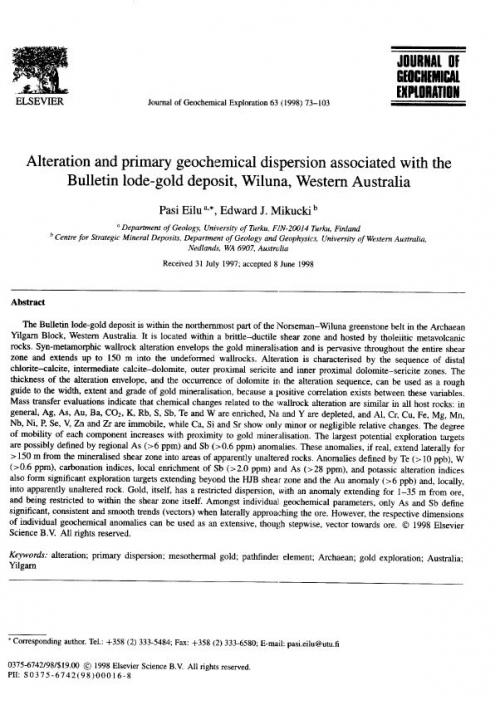 The sericitic alteration in the andesite dikes is unrelated to the gold deposits. A number of dating techniques did not work. K/Ar and 40Ar/39Ar dates on mica from mineralized Ordovician to Devonian sedimentary rocks gave misleading results. The youngest date of 149 Ma from the smallest <0.1-)U,m-size fraction shows that the temperature (120°-260°C) and duration (?) of hydrothermal activity was insufficient to reset preexisting fine-grained micas in the host rocks. The temperature and duration was also insufficient to anneal fission tracks in zircon from Ordovician quartzites as they yield Middle Proterozoic dates in both mineralized and barren samples. Apatites were too small for fission track dating. Hydrothermal sulfides have pronounced crustal osmium isotope signatures (18'Os/188Osinitiai = 0.9-3.6) but did not yield a meaningful isochron due to very low Re and Os concentrations and large analytical uncertainties. Paleomagnetic dating techniques failed because the hydrothermal fluids sulfidized nearly all of the iron in the host rocks leaving no remnant magnetism. Издание: PGS Publishing, Linden Park, 2002 г., 12 стр. 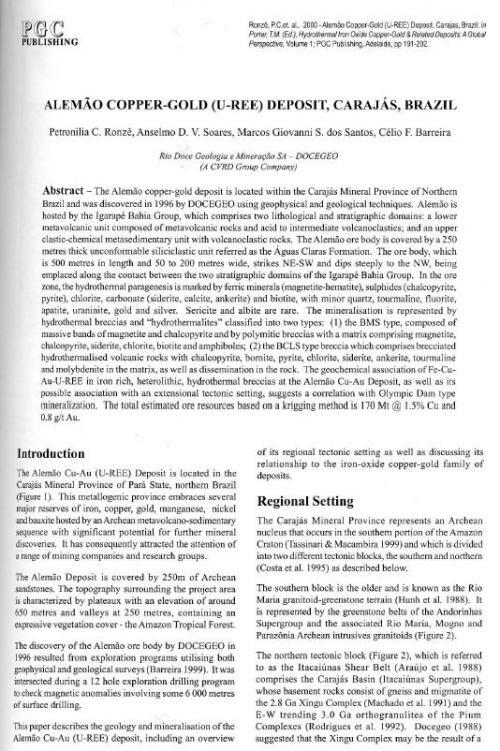 The Alemao copper-gold deposit is located within the Carajas Mineral Province of Northern Brazil and was discovered in 1996 by DOCEGEO using geophysical and geological techniques. Alemao is hosted by the Igarape Bahia Group, which comprises two lithological and stratigraphic domains: a lower metavolcanic unit composed of metavolcanic rocks and acid to intermediate volcanoclastics; and an upper clastic-chemical metasedimentary unit with volcanoclastic rocks. The Alemao ore body is covered by a 250 metres thick unconfonnable siliciclastic unit referred as the Aguas Claras Formation. The ore body, which is 500 metres in length and 50 to 200 metres wide, strikes NE-SW and dips steeply to the NW, being emplaced along the contact between the two stratigraphic domains of the Igarape Bahia Group. In the ore zone, the hydrothermal paragenesis is marked by ferric minerals (magnetite-hematite), sulphides (chalcopyrite, pyrite), chlorite, carbonate (siderite, calcite, ankerite) and biotite, with minor quartz, tourmaline, fluorite, apatite, uraninite, gold and silver. Sericite and albite are rare. The mineralisation is represented by hydrothermal breccias and "hydrothermalites" classified into two types: (1) the BMS type, composed of massive bands of magnetite and chalcopyrite and by polymitic breccias with a matrix comprising magnetite, chalcopyrite, siderite, chlorite, biotite and amphiboles; (2) the BCLS type breccia which comprises brecciated hydrothermalised volcanic rocks with chalcopyrite, bornite, pyrite, chlorite, siderite, ankerite, tourmaline and molybdenite in the matrix, as well as dissemination in the rock. 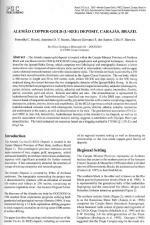 The geochemical association of Fe-Cu-Au-U-REE in iron rich, heterolithic, hydrothermal breccias at the Alemao Cu-Au Deposit, as well as its possible association with an extensional tectonic setting, suggests a correlation with Olympic Dam type mineralization. 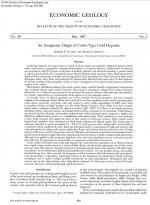 The total estimated ore resources based on a krigging method is 170 Mt @ 1.5% Cu and 0.8g/tAu. Издание: Economic geology, 2003 г., 17 стр. Carlin-type deposits in the Alligator Ridge mining district are present sporadically for 40 km along the north-striking Mooney Basin fault system but are restricted to a 250-m interval of Devonian to Mississippian strata. Their age is bracketed between silicified ca. 45 Ma sedimentary rocks and unaltered 36.5 to 34 Ma volcanic rocks. The silicification is linked to the deposits by its continuity with ore-grade silicification in Devonian-Mis-sissippian strata and by its similar δ18O values (~17‰) and trace element signature (As, Sb, Tl, Hg). Eocene reconstruction indicates that the deposits formed at depths of ≤300 to 800 m. In comparison to most Carlin-type gold deposits, they have lower Au/Ag, Au grades, and contained Au, more abundant jasperoid, and tex-tural evidence for deposition of an amorphous silica precursor in jasperoid. These differences most likely result from their shallow depth of formation. 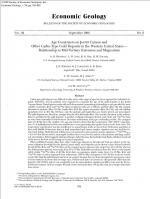 Издание: Journal of Geochemical Exploration, 1998 г., 31 стр. Автор(ы): Jean S. Cline, Tracy L.C. Издание: Economic geology, 2001 г., 18 стр. Wall-rock alteration at the Getchell underground deposit was examined to determine the effects of Au-bear-ing fluids on host lithologies and the relationship between K-bearing alteration minerals and Au deposition. The major, minor, and trace element geochemistry of highly altered and mineralized to unmineralized rocks from the Getchell deposit was quantified for more than 50 samples collected along 13 transects through calcareous siltstone and carbonaceous limestone and along one transect through a rhyodacite dike. Each transect in sedimentary rocks was collected along a single homogeneous bed that could be followed from high-grade ore to moderately altered rock or waste rock. Analyses were obtained for 39 elements, 10 oxides, and loss on ignition, using multiple techniques. Petrographic studies were integrated with geochemistry and X-ray diffraction and electron microbeam analyses to identify ore and alteration minerals and to correlate mineralogy with geochemical fluxes. Издание: PGS Publishing, Linden Park, 2002 г., 18 стр. No single model satisfactorily accounts for the diverse characteristic of Fe-oxide-rich hydrothennal systems. Consideration of a spectrum of geologically reasonable models gives insight into the origins of variability among these deposits. 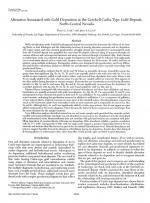 Key features that need to be rationalized by any model are the abundance of hydrothermal magnetite and/or hematite, the chemically distinct suite of elements (REE-Cu-Co-Au-Ag-U), the variability of associated magmas, the distributions and volumes of associated hydrothennal alteration, and the broader geologic setting(s). Geologic and geochemical evidence show that the ore-fonning fluids are brines, but the source of the brines is controversial. Multiple sources are possible, indeed likely. The identity and consequences of alternative sources - magmatic and non-magmatic are considered: First, by a review of plausible fluids and general consequences, second, by examination of the system characteristics, third, by specific consideration of the consequences of alternative models, and fourth, by consideration of selected systems where non-magmatic brines must play a major role. We review some of the key characteristics of different types of hydrothermal Fe-oxide-rich(-Cu-Au) systems. Some are economic; many are only geochemically anomalous. Two end-members and several variants on these end members are proposed. One group is typified by relatively high-temperature mineralization, and relatively high K/Na and Si/Fe in the alteration. We suggest that these features (and others) are distinctive of magmatic fluid sources and that this group overlaps with porphyry Cu-Au and related deposit types. A second, broad group is typified by more oxide-rich, sulfide-poor mineralization, low Si/Fe ratios, and voluminous alkali-rich alteration where sodic types commonly exceed K-rich varieties. We suggest that the key features of this group reflect involvement of non-magmatic brines and that ore grades are less common as the metals are less easily trapped. Hybrid examples, where fluids of both types are involved, are expected (and known). 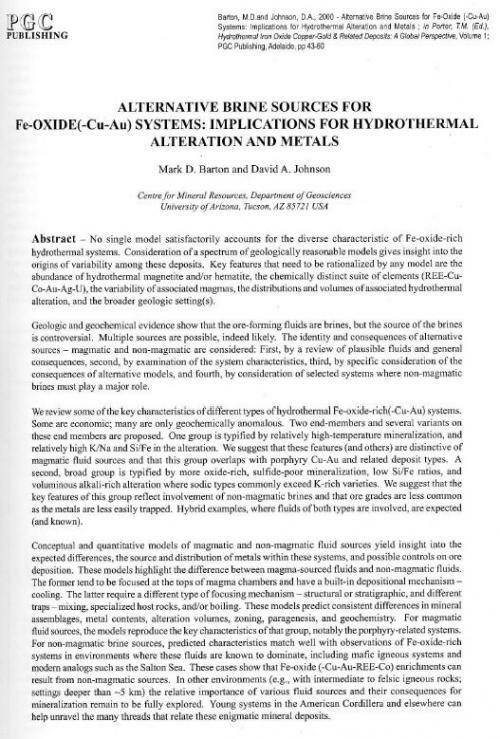 Conceptual and quantitative models of magmatic and non-magmatic fluid sources yield insight into the expected differences, the source and distribution of metals within these systems, and possible controls on ore deposition. These models highlight the difference between magma-sourced fluids and non-magmatic fluids. The former tend to be focused at the tops of magma chambers and have a built-in depositional mechanism -cooling. The latter require a different type of focusing mechanism - structural or stratigraphic, and different traps - mixing, specialized host rocks, and/or boiling. These models predict consistent differences in mineral assemblages, metal contents, alteration volumes, zoning, paragenesis, and geochemistry. 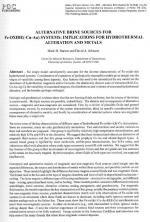 For magmatic fluid sources, the models reproduce the key characteristics of that group, notably the porphyry-related systems. For non-magmatic brine sources, predicted characteristics match well with observations of Fe-oxide-rich systems in environments where these fluids are known to dominate, including mafic igneous systems and modem analogs such as the Salton Sea. These cases show that Fe-oxide (-Cu-Au-REE-Co) enrichments can result from non-magmatic sources. In other environments (e.g., with intermediate to felsic igneous rocks; settings deeper than ~5 km) the relative importance of various fluid sources and their consequences for mineralization remain to be fully explored. Young systems in the American Cordillera and elsewhere can help unravel the many threads that relate these enigmatic mineral deposits. Автор(ы): Childs C., Nicol A., Walsh J.J.
Издание: Pergamon, 2002 г., 7 стр. Conventional growth models suggest that faults become larger due to systematic increases in both maximum displacement and length. 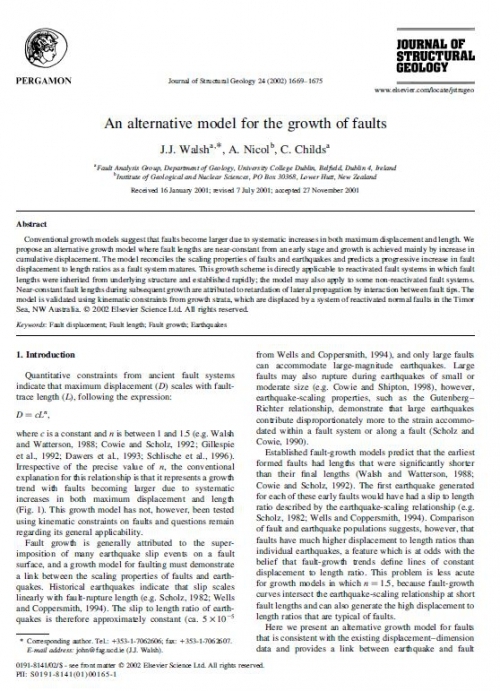 We propose an alternative growth model where fault lengths are near-constant from an early stage and growth is achieved mainly by increase in cumulative displacement. 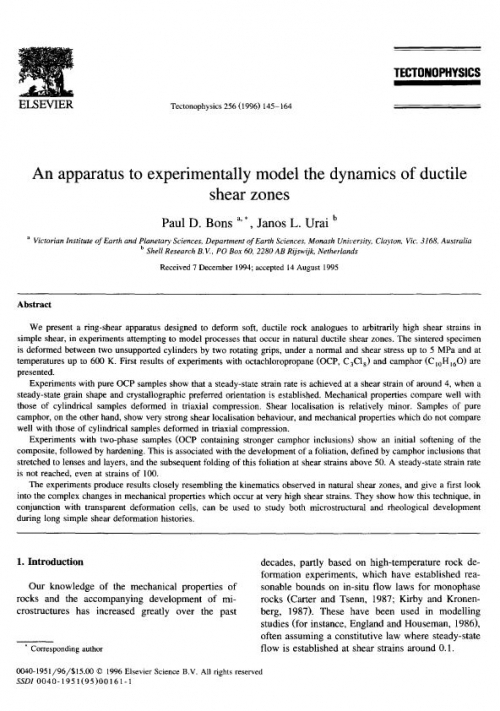 The model reconciles the scaling properties of faults and earthquakes and predicts a progressive increase in fault displacement to length ratios as a fault system matures. 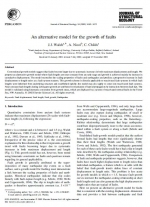 This growth scheme is directly applicable to reactivated fault systems in which fault lengths were inherited from underlying structure and established rapidly; the model may also apply to some non-reactivated fault systems. Near-constant fault lengths during subsequent growth are attributed to retardation of lateral propagation by interaction between fault tips. 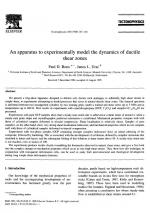 The model is validated using kinematic constraints from growth strata, which are displaced by a system of reactivated normal faults in the Timor Sea, NW Australia. Издание: Economic geology, 1996 г., 20 стр. 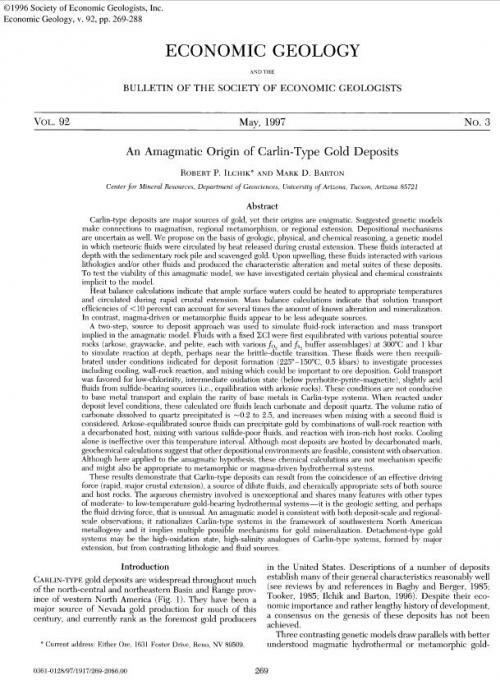 Carlin-type deposits are major sources of gold, yet their origins are enigmatic. Suggested genetic models make connections to magmatism, regional metamorphism, or regional extension. Depositional mechanisms are uncertain as well. 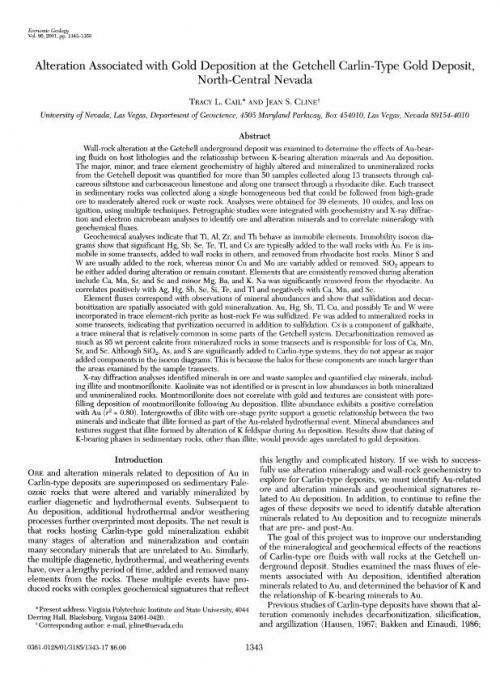 We propose on the basis of geologic, physical, and chemical reasoning, a genetic model in which meteoric fluids were circulated by heat released during crustal extension. These fluids interacted at depth with the sedimentary rock pile and scavenged gold. Upon upwelling, these fluids interacted with various lithologies and/or other fluids and produced the characteristic alteration and metal suites of these deposits. To test the viability of this amagmatic model, we have investigated certain physical and chemical constraints implicit to the model. Автор(ы): Bons P.D., Urai J.L. 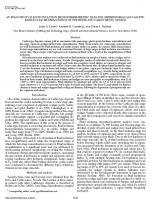 Издание: Journal Tectonophysics, 1996 г., 20 стр. We present a ring-shear apparatus designed to deform soft, ductile rock analogues to arbitrarily high shear strains in simple shear, in experiments attempting to model processes that occur in natural ductile shear zones. The sintered specimen is deformed between two unsupported cylinders by two rotating grips, under a normal and shear stress up to 5 MPa and at temperatures up to 600 K. First results of experiments with octachloropropane (OCP, C3C18) and camphor (C10Hl6O) are presented. Издание: Economic geology, 2002 г., 6 стр. 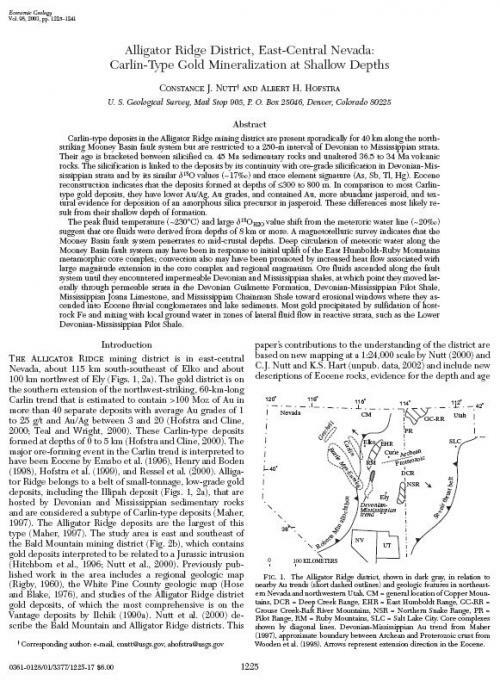 Carlin-type deposits contain gold in association with main-stage quartz-pyrite-kaolinite mineralization and late-stage orpiment-realgar-calcite-barite mineralization. Fluid characteristics for main-stage mineralization are well documented by fluid inclusion and stable isotope studies on quartz. In contrast, fluid characteristics for late-stage mineralization are not well constrained because of large ranges in fluid inclusion microthermo-metric data. These ranges could represent real variations in fluids or be a result of the reequilibration of fluid inclusions. 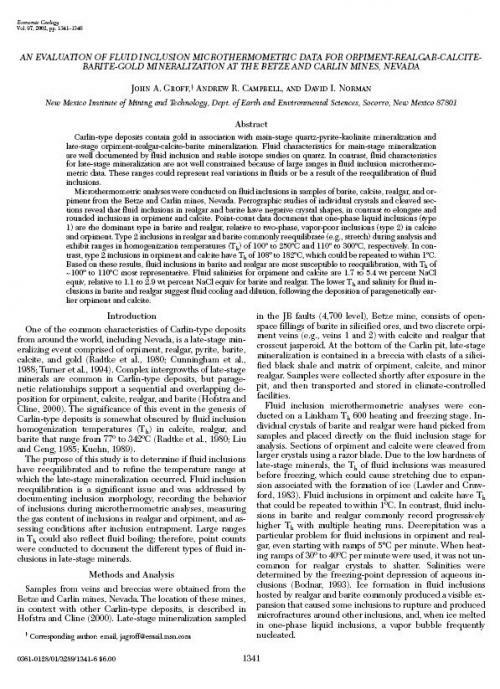 Microthermometric analyses were conducted on fluid inclusions in samples of barite, calcite, realgar, and or-piment from the Betze and Carlin mines, Nevada. Petrographic studies of individual crystals and cleaved sections reveal that fluid inclusions in realgar and barite have negative crystal shapes, in contrast to elongate and rounded inclusions in orpiment and calcite. Point-count data document that one-phase liquid inclusions (type 1) are the dominant type in barite and realgar, relative to two-phase, vapor-poor inclusions (type 2) in calcite and orpiment. Type 2 inclusions in realgar and barite commonly reequilibrate (e.g., stretch) during analysis and exhibit ranges in homogenization temperatures (Th) of 100º to 250ºC and 110º to 300ºC, respectively. In contrast, type 2 inclusions in orpiment and calcite have Th of 108º to 182ºC, which could be repeated to within 1ºC. Based on these results, fluid inclusions in barite and realgar are most susceptible to reequilibration, with Th of ~100º to 110ºC most representative. Fluid salinities for orpiment and calcite are 1.7 to 5.4 wt percent NaCl equiv, relative to 1.1 to 2.9 wt percent NaCl equiv for barite and realgar. The lower Th and salinity for fluid inclusions in barite and realgar suggest fluid cooling and dilution, following the deposition of paragenetically earlier orpiment and calcite.